Sometimes shadow adds a whole new dimension to a piece it is cast from. A shadow creates a passing moment, dependent on a particular angle of light and the surface that catches that light or lack of light. It defines a solid in new, albeit fleeting, terms. And, there needs to be a witness to that moment. 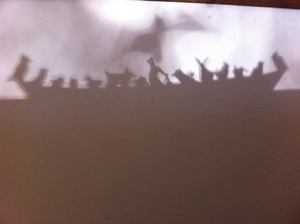 It’s odd that the formation of a shadow, which is totally illusive, can cause so much delight, it’s practically theatrical! It’s real but it’s a distortion of real. Evening light is like going to the circus and you are the tall man. Mid day you are standing in your own dark puddle of yourself. Be observant and you can tell time by it. 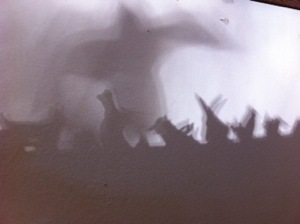 Shadows enchant, they are in-the-moment light shows. Blink and they are changed then … gone, you just cannot hold on to them. They are there then they are not. Maybe that is what is so compelling about them. The bird-like image looming over the boat is one of those taped black paper cut out birds that caution real birds from flying into the window. It is about 15′ away from the boat. The boat with all the figures that is casting that shadow is a porcelain clay boat from the series called Life Boats. I was enchanted …. And then it was gone.